Home › Uncategorized › Gov. 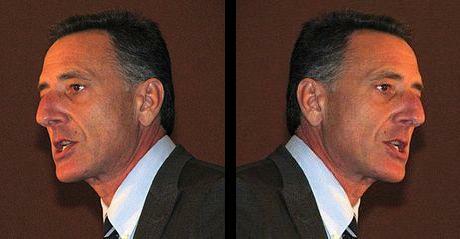 Shumlin Flip-flops on Taxes?!? Gov. Shumlin Flip-flops on Taxes?!? Or, why it’s OK to tax those who can afford it sometimes, but not others? I was listening to the Mark Johnson Show yesterday when he was interviewing the Governor and they started talking about the budget bill. The Governor said that he hoped that the Senate would reinstate the tax on non-Medicare and Medicaid dental services and not raise the cigarette tax. Mark noted that it was surprising to hear a politician not supporting an increased tax on tobacco. Since the podcast is not available yet, I don’t have the Governor’s exact quote, but here is the gist of what he replied – because of the demographics of who smokes and who doesn’t, the tobacco tax falls most heavily on lower income Vermonters who can’t afford it. People are addicted to cigarettes, and we shouldn’t penalize them more. However, the people who are getting these dental services done can afford to pay the little bit extra for the tax on these services. Isn’t this the same lame excuse we got from Governor Douglas? We can’t tax the rich, because they’ll move out of Vermont. Plus, Florida – even northern Florida is 14 hours away by car, but I digress. There is Insufficient Data to Claim that Vermonters are Migrating Due to High Taxes – Current Statistics Demonstrate an In-Migration of Income. Available data suggests that those entering Vermont earn more than those leaving. Also, Vermont’s top tax bracket is populated by high-income events, not high-income earners. While the data cannot determine something as subjective as why people are moving, it does demonstrate that definitive claims that the wealthy are moving out and about the effect of this migration are more complicated than currently assumed. The person who posted this on Green Mountain Daily put it succinctly – “it makes your head hurt, doesn’t it?” Where are Lewis Carroll and Franz Kafka when we need them? The Progressive Party legislators proposed an amendment to the tax bill to raise income taxes on the top two tiers of filers in Vermont in order to stave off some of the budget cuts in human services. It was defeated. There were legislators who agreed with this position, but not now or in this particular bill. So, back to the top and the sub-title to this post – Can we get the Governor to explain why it’s OK to tax those who can afford it when they get a crown at the dentist, but not those Vermonters who have high incomes and pay little or no state income tax? Sen. Tim Ashe of Chittenden County said that when the miscellaneous tax bill makes its way to the Senate, he will seek to amend it to get the state to do a better job collecting taxes from the seven Vermonters who reported incomes higher than $1 million in the 2009 tax year and paid nothing in state income taxes. Data from the state Tax Department also show that more than 1,000 tax filers reported incomes higher than $100,000 but paid less than $1,000 in state income tax in 2009. Or can we get the Governor to explain why we shouldn’t add a hardship to those who smoke cigarettes, but it’s OK to add hardships to those needing services and support because of disability, age or mental health issues? I hope someone asks these questions. This post was cross-posted at Green Mountain Daily – join the conversation there.